The Friedrich Naumann Foundation for Liberty (FNF) congratulates liberal President Benigno “Noynoy” Aquino as the 15th President of the Republic of the Philippines. 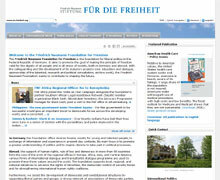 FNF joins the world community in celebrating a new era of clean and honest government in the Philippines. 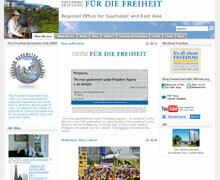 In the website of its Headquarters in Germany and of the Regional Office for Southeast and East Asia, the compelling leadership of President Aquino is highlighted. President Aquino brings back the Liberal Party in power after 45 years since the last liberal president was elected. The Aquino administration’s battlecry “Kung Walang Corrupt Walang Mahirap” (Without corruption there is no poverty) is a resounding message of hope for Filipinos after nine years of misrule of the previous regime. 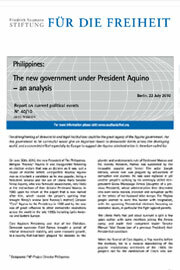 Mr. Jules Maaten, the Resident Representative of the Philippine Office, in his analysis of the new government, states that “great poverty and a stagnant economy largely because of vested interests, and the ongoing military conflict with the Islamic separatists in Mindanao are issues the President has to make a good progress with.” “Over the longer term, the prospects for Philippine prosperity and the viability of Philippine democracy depend on the emergence of stronger political institutions,” Mr. Maaten said further. Click here to view the complete report. FNF takes pride in the new cabinet of President Aquino. The FNF Philippine Office has worked with a number of his cabinet members, among them: Department of Budget and Management (DBM) Secretary Florencio Abad who was a founding member of the Council of Asian Liberals and Democrats (CALD) and Chair in 1999; Department of Local and Interior Government (DILG) Secretary Jesse Rebredo who attended the International Academy for Leadership (IAF) Seminar on Political Leadership in 2009 and who hosted an IAF Replication Seminar on New Public Management in Naga in 2008; Communications Group Secretary Ricky Carandang, and Manolo Quezon who were former board members of the liberal think tank National Institute for Policy Studies (NIPS). In President Aquino's State of the Nation Address (SONA) on 30 June 2010, he emphasized private-public partnerships, which is believed can spur economic growth. He encouraged open competition in the market and promised to ensure this by eliminating monopolies and cartels. Free market economy is one of the basic tenets of liberalism.